#169: Half-Baked…and Loving It! | Related How Again? 169.1 There are 2 ideas that when combined can cause much error and confusion. 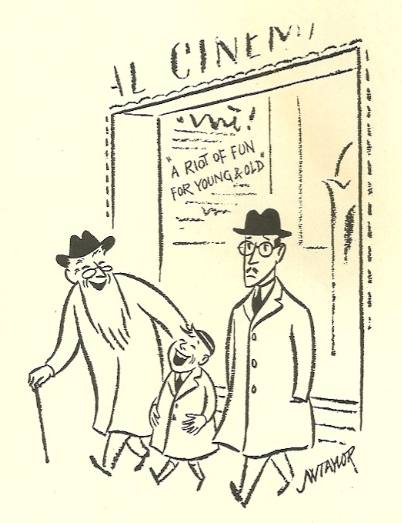 Happily, the first idea is confined mainly to the halls of academia…altho some ambitious civilians…wanting to be hip to the latest jive (and it is 100% jive)…have embraced it as the cool new thing. And that’s the idea of being “nonjudgmental”…which means nothing is right or wrong, only different. It follows that nothing is better or worse than anything else. I daresay the overwhelming majority of the world disagrees with this concept, but it’s out there. 169.3 The second idea is summed up by another old saying: “A little knowledge is a dangerous thing.” And do I have a pertinent example in mind? Oh boy, do I ever! I was cleaning up my computer files and found a back-and-forth I had a while ago with a guy who has a page on kinship…we’ll call him Blogger B. I will not link to this site…it needs as little publicity as it can get…from the hints that follow, you can Google it easily enough. Not surprisingly, he goes wrong on removed cousins…several folks besides me call him on it, but he just says our system is ambiguous, or else, other people use different systems, which is complete BS. No, other people make the same mistake that you do, my friend. 169.4 So I finally gave up…oh yeah, and I deleted these files I had saved. Still, Blogger B was wrong in a very interesting way, so it’s an instructive case. 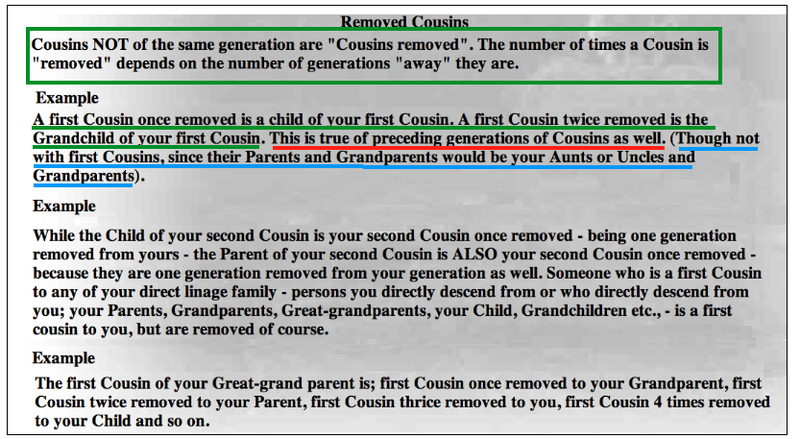 The part about removed cousins that he correctly understands is that “removed” means generations removed from you…your father, his siblings, and his cousins are one generation removed form you…your grandfather and his sibs and cousins, two generations, etc. 169.5 What he didn’t understand was exactly how being removed applies to cousins. He was correct to say your 2nd cousin’s son is your 2nd cousin once removed…since the son is one generation away from the father, who is your 2nd cousin. But then he tried to go the other way and said your 2nd cousin’s father is also your 2nd cousin once removed, because that too is one generation removed from your 2nd cousin’s generation. 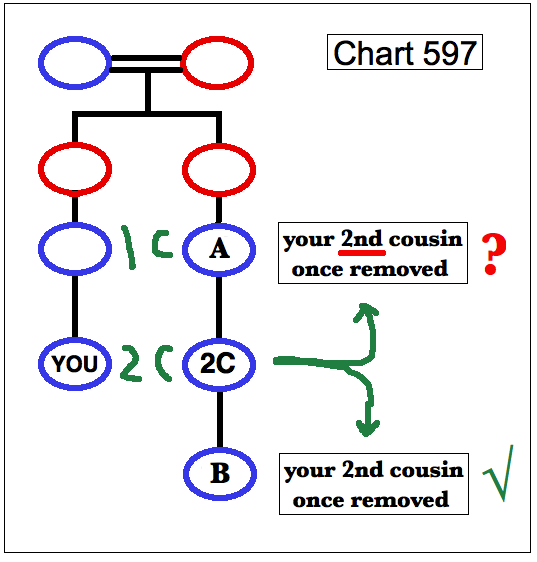 Which is completely wrong…your 2nd cousin’s father is your 1st cousin once removed…for the simple reason that your 2nd cousin’s father is your father’s 1st cousin…and the sons of 1st cousins, you and your 2nd cousin, are 2nd cousins, by definition. 169.6 And since Blogger B is not a rational thinker, and cannot follow ideas to their logical conclusion, he misses 2 very curious things that result from his “system.” Who is your 1st cousin once removed? Going down, your 1st cousin’s son…and also, gong up, your 1st cousin’s father, better known as….your uncle!…as per Chart 598a. Have you ever in your life heard your uncle described as some sort of cousin to you? Don’t feel bad…nobody has. 169.7 The second thing he misses is illustrated by Chart 598b…you are a 2nd cousin once removed to neither of your 2nd cousins once removed: to the one in your father’s generation you’re his 1st cousin once removed…and to the one in your son’s generation, you’re his 3rd cousin once removed. Have you ever heard of the degree or number of a cousin changing, depending on which way you look at it: to me, you are my 1st cousin, but to you I am your 2nd cousin? Well, according to Blogger B, you have now! 169.9 Now the part I put in the green box is fine…so is the part I underlined in green…green for go. The red is for stop…no, this is not true of preceding generations of cousins as well. That would be the same backing up manuever that Blogger B likes to do…getting to your 1C 1R ascending thru your 2nd cousin, and therefore calling him a 2C 1R. But check the part I underlined in blue…this cat here sees what Blogger B missed, which is you can’t go backwards from your 1st cousin, otherwise your uncle is also your 1C 1R. 169.11 The part underlined in blue, true. Red, definitely not…but compare that to the very next sentence, underlined in green…he contradicts what he just said! Thus, the final “example” in the green box, agrees with the green underline, disagrees with the red. 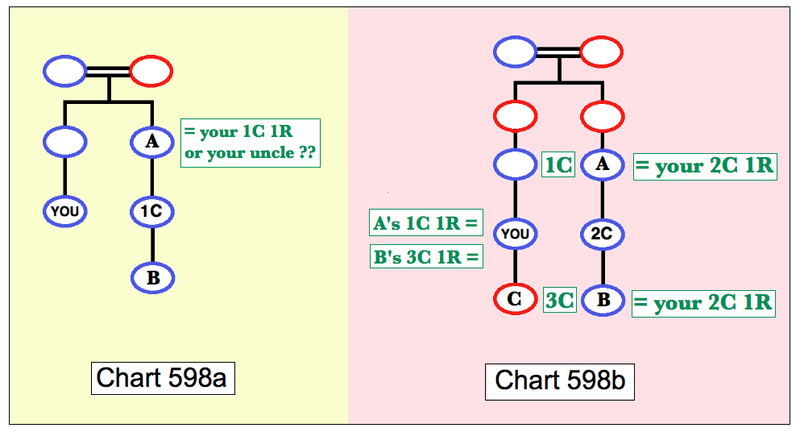 And what you end up with is shown in Chart 599…underlined in red gives you the red box..underlined in green, the green box….your father’s 1st cousin is both your 2C 1R and your 1C 1R. Somebody isn’t thinking straight, are they? 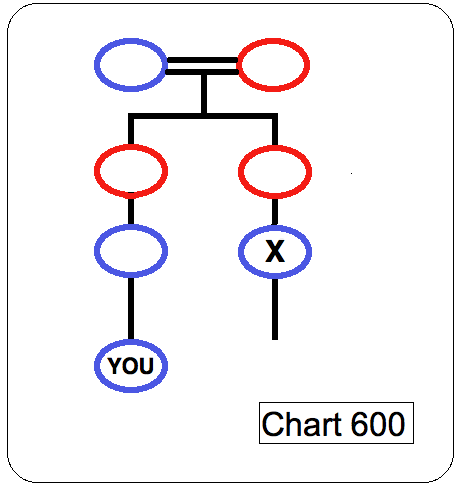 169.13 Bottom line: 2 people are related because they have a common ancestor, not a common descendant. Proof: your father and your mother have a common descendent, namely you!…but they aren’t related, at least not normally…and if they were, it was before you ever came into the picture. What’s more, to be related at all, you have to be able to trace a path from one to the other along your family tree. 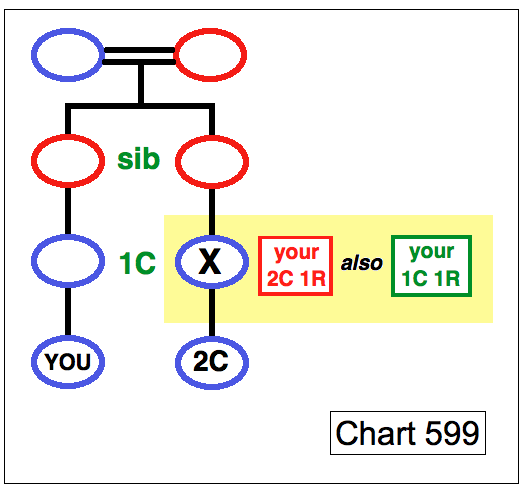 169.14 If we do that in Chart 601a, we see that you are related to your 1C 1R because he is your father’s 1st cousin…that’s where the trail leads…not because he is your 2nd cousin’s father. 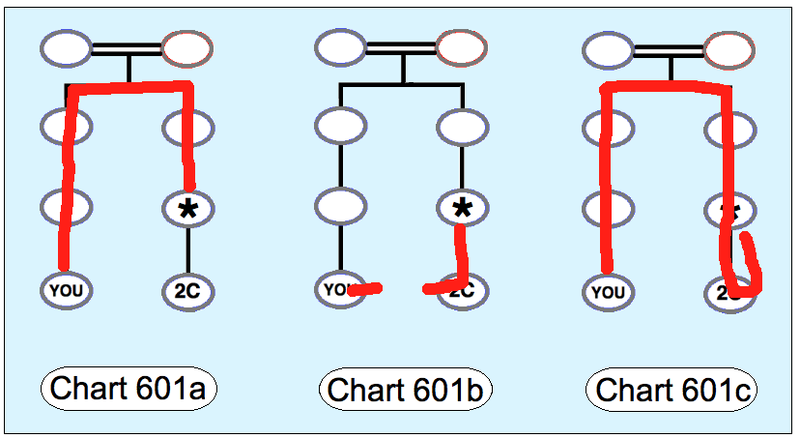 If we try to get to him by tracing a path thru your 2nd cousin…Chart 601b…we find there is no path to follow! Unless you try a double-back approach as in Chart 601c…except it doesn’t work that way…once you get to where you’re going, you stop dead in your tracks, dammit! And be here again next week, same time, same channel, aloha. This entry was posted in baby boomers, cousins, genealogy, kinship, relationships. Bookmark the permalink.